This was received through a new book club I joined in my city. Excited to start this seriously massive book! Anyone read the rest of this series? I heard that it's both a standalone and I should read the others first. Help?! Do I or don't I? I have Intangible on my Kindle and i love the cover! I hope you enjoy everything you got this week. Here's my IMM! I haven't read Bitterblue yet though I did enjoy Graceling and Fire. I have a chance to win a copy of Bitterblue at LibraryThing and am keeping my fingers crossed. Intangible and Unspoken look good too. My YA mailbox is here. Happy reading! Great set! I really want to read Unspoken and Bitterblue. Enjoy! I can't believe you've got Unspoken - so jealous! - hope you enjoy it. BITTERBLUE?!?! omg the jealousy... I am green. GREEN I TELL YOU! I think you'll be fine if you read it without having read Graceling and Fire, but they're both good, so I would definitely pick those two up at maybe the library? This is my first time hearing of Unspoken! I've seen the other two around. I have not read the Graceling series but I always suggest series are read in order. I agree! I really dislike reading things out of order even if they're unrelated. I would read the other two before if I had more than a month. The book is so big, it's kind of intimidating, haha. I'm excited for Unspoken too! See! I don't like just reading one, but it being a good 500 or so pages kind of keeps me from reading the rest before it since I have less than a month. Guess I'll have to break my rule this one time. I've heard nothing but good things for the Graceling books! I really should read them sometime. 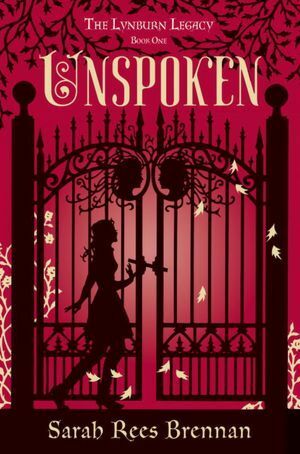 I also received Unspoken -- can't wait to read it! A wonderful cover AND an interesting story. Thanks for stopping by my blog! :) Happy reading! Ahh, Unspoken! I love Sarah Rees Brennan so I'm totally pumped for that one.